« Wait, the Windows 10 Anniversary Update wasn’t already enterprise-ready? On December 8, Microsoft released its first major Windows 10 build using the new Unified Update Platform. So far, many users — including yours truly — experience Download hanging at 0% progress. MS has issued a workaround that lets users download despite that difficulty. Unaware that the problem was widespread, I immediately tried the Windows Update MiniTool when I got stuck myself. I’m pleased to report that WUMT works with UUP, and grabbed the update for installation without a hitch. In fact, I experienced my fastest ever download times using the tool yesterday, hitting a whopping 450 Mbps on my putative 300 Mbps connection. Though WU got stuck, WUMT happily downloaded — and starting installing — Build 14986. Aside from the obvious — that WUMT works quite happily with UUP — this informal test tells us that the internal mechanisms for UUP don’t alter Windows Update deliver fundamentals. I’d been wondering if UUP would change things enough to make WUMT fail. It’s nice to see it continue working in the face of changes to Windows Update behavior. We know that UUP checks the manifest of installed updates on PCs requesting them. It sends only missing items in response. It’s great that these changes don’t keep WUMT from working. 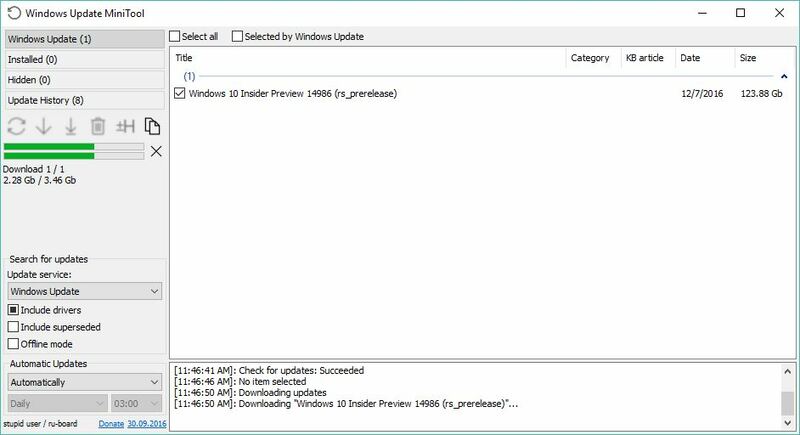 I had already recommended WUMT as a Windows Update replacement and reported that WUMT Does Updates When WU Can’t or Won’t in earlier blog posts here. It tickles me that WUMT keeps on ticking, even as UUP makes the scene.